What do you do to your Earth?the simple thing is put in your garbage in your trash bag right?and maybe do some 3R (Reduce Reuse Recycle) in your daily, for example is always bring your own Shoppers Bag in your Bag, so u can always use it many..many time. Our one of Fashion Blogger Diana Rikasari have awesome project LOVE EARTH . 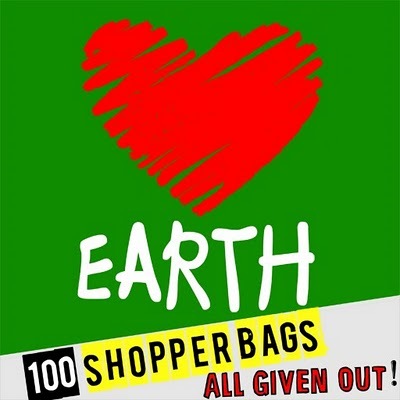 She is made a Shoppers bag and she produced 100 LOVE EARTH shopper bags to give away for free to 100 people who wants to participate in living green in the simplest way..(psst..I'm the one whose have LOVE EARTH Shoppers Bag), wow..so brilliant right..two thumbs for you Diana..
Diposting oleh Cilya "Sheshe" di 04.54 | Label: Events and Promotion in Wonderland | Estou lendo: LOVE EARTHTweet this! | Assine o Feed.